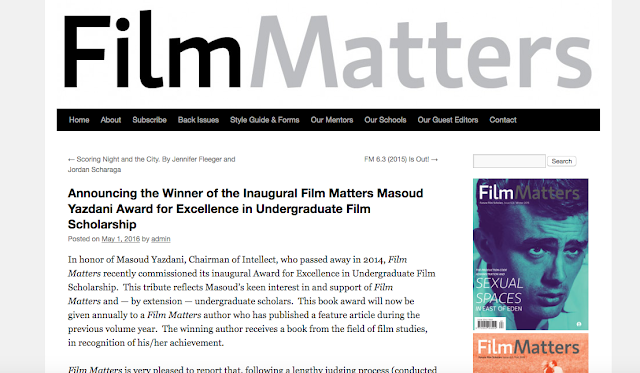 In honor of Masoud Yazdani, Chairman of Intellect, who passed away in 2014, Film Matters recently commissioned its inaugural Award for Excellence in Undergraduate Film Scholarship. This tribute reflects Masoud’s keen interest in and support of Film Matters and — by extension — undergraduate scholars. This book award will now be given annually to a Film Matters author who has published a feature article during the previous volume year. The winning author receives a book from the field of film studies, in recognition of his/her achievement. Film Matters is very pleased to report that, following a lengthy judging process (conducted by three individual academics based at institutions of higher education worldwide), the winner of the first Yazdani Award is Christina Newland, for her FM 5.1 (2014) article, “Archetypes of the Southern Gothic: The Night of the Hunter and Killer Joe.” Congratulations to Christina on her fine achievement, among what was an exceptionally high level of writing across the entire group of essays. You can read more here, at the Film Matters website.